Richard Branson, the billionaire tycoon who controls London-based Virgin Atlantic, said at a news conference in Chicago yesterday that he was considering nonstop flights to Honolulu and Perth, Australia. Branson provided no details in terms of timing or type of aircraft, and a spokeswoman for the carrier's U.S. office was unable to provide more information yesterday. Branson singled out the two destinations as expansion options during a broader announcement in which Virgin Atlantic announced the largest order yet by a European airline for Boeing's new 787 Dreamliner. 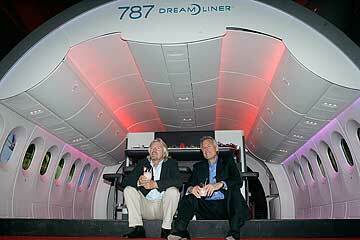 Virgin Atlantic, whose order could be worth up to $8 billion, is ordering 15 of the 787-9 Dreamliners with options on ordering eight 787-9s and purchase rights on an additional 20 aircraft. The carrier will take delivery of the new aircraft beginning in 2011. The 787-9s can carry up to 290 passengers depending on the bed or seat layout. The airline also said it has extended leases on some 416-seat Boeing 747-400 aircraft and is adding routes from its London base this year to Chicago, Nairobi and the Indian Ocean island of Mauritius. Jonathan Ornstein, chairman and chief executive of go! parent Mesa Air Group Inc., worked in Europe with Branson for 3 1/2 years and described him as "the most entrepreneurial person I know." "If anyone can (fly nonstops to Honolulu from London), it's Richard," said Ornstein, who was chief executive and chairman of Belgium-based, low-cost, intra-Europe carrier Virgin Express, a sister airline of Virgin Atlantic that merged last year into SN Brussels Airlines. "Having worked in Europe, I will tell you that there is always a search for new vacation destinations," he said. "If this aircraft allows European tourists to visit a place that they've not been able to get to, I think it could be a very good market." Last December, low-cost Australian airline Jetstar began service to Honolulu from Sydney and Melbourne with plans to transition to the 787 in 2008 when it becomes available. Until then, Jetstar, a subsidiary of Qantas Airways, has been using Airbus A330-200s. CHICAGO » Boeing Co. said yesterday it was partnering with London-based Virgin Atlantic to develop a new biofuel for commercial jets as part of an effort to reduce carbon emissions. Boeing executives and Virgin Atlantic Chairman Richard Branson announced the partnership at a news conference where they said they hope to launch a test flight of a biofuel-powered 747 in the next year. Officials at both companies declined to comment on the value of their investment in the biofuel project, which follows a similar airline industry initiative. It could take at least five years before any jet biofuel, likely made from cellulosic material, is widely available on commercial flights. Branson said he hopes the new fuel and more widesp-read use of Boeing's twin-engine 787s will help reduce the overall pollution generated by the airline industry, which is responsible for about 2 percent of the world's carbon emissions. "Doing nothing should not be an option," he said.